AN ELDERLY woman with long, grey plaits, wearing a traditional Tibetan apron of wool in colourful stripes, has spent her day weaving thread outside her home near the southern end of Qinghai Lake, high on the Tibetan plateau. She is among hundreds of thousands of Tibetan nomads who have been forced by the government in recent years to settle in newly built villages. She now lives in one of them with her extended family and two goats. Every few months one of her sons, a red-robed monk, visits from his monastery, a place so cut off from the world that he has never heard of Donald Trump. Her grandson, a 23-year-old with slick hair and a turquoise rain jacket, is more clued in. He is training to be a motorcycle mechanic in a nearby town. Theirs is a disorienting world of social transformation, sometimes resented, sometimes welcome.Chinese and foreigners alike have long been fascinated by Tibet, romanticising its impoverished vastness as a haven of spirituality and tranquillity. Its brand of Buddhism is alluring to many Chinese—even, it is rumoured, to Peng Liyuan, the wife of China’s president, Xi Jinping. Many Tibetans, however, see their world differently. It has been shattered by China’s campaign to crush separatism and eradicate support for the Dalai Lama, their spiritual leader who fled to India after an uprising in 1959. The economic transformation of the rest of China and its cities’ brash modernity are seductive, but frustratingly elusive. TODAY marks the 48th consecutive day of protests in Jammu & Kashmir, India’s only Muslim-majority state. Young Kashmiri men have been on the streets calling for independence from India and throwing stones at security forces. Indian security forces have responded with tear gas and shotguns that fire small-bore pellets instead of buckshot. A strict curfew has also been imposed across the Kashmir valley, which includes Srinagar, the region’s largest city. So far, 66 civilians and two police officers have been killed in the violence. Why are Kashmiris protesting? The region has been disputed since the partition of India and Pakistan in 1947. Both sides claim the territory and have fought three wars over it. Kashmir has been living under India’s Armed Forces (Special Powers) Act, which gives special powers to the army, since the eruption in 1990 of an armed insurgency that was covertly supported by Pakistan. Some 40,000 people have been killed since. Even in the relatively peaceful past decade, unrest has flared up, most notably in the summers of 2008 and 2010. The current protests started on July 9th after Indian security forces killed Burhan Wani, a young and charismatic Islamist militant. Resentment had been building for months. Kashmiris worried when Narendra Modi’s Hindu-nationalist Bharatiya Janata Party (BJP) came to power in 2014 that his national government would make life difficult for Muslims. At state elections later that year, the local Peoples Democratic Party formed a coalition with the BJP, leaving them feeling betrayed. Wani’s killing has mobilised a generation that had grown up under what it sees as an illegitimate Indian occupation. The result has been a seven-week cycle of violent protests and retaliatory action by the police and paramilitary forces. Their supposedly non-lethal pellets have blinded dozens and injured hundreds. Shops and businesses have remained closed since the protests started, either under curfew orders or because of calls for strikes from separatist leaders. Many Kashmiris have not left their homes for weeks. Few expect the situation to improve any time soon, despite soothing words this week from Mr Modi and a visit to the region by India’s home minister.An obstacle to any lasting solution is India’s insistence on seeing Kashmir through the prism of its rivalry with Pakistan. The Indian government’s immediate reaction to this summer’s unrest was to accuse its neighbour of meddling. In fact, Wani was a home-grown insurgent; the young men on the streets are locals. Unemployment is widespread and economic opportunities are few. The state was also promised special status, guaranteeing autonomy, in India’s constitution. And many Kashmiris now want more: a survey in 2010 by Chatham House, a think-tank, found overwhelming support for independence. Kashmiris are at best ambivalent about their attachment to India. Until the government recognises their demands, the anger is unlikely to dissipate. At least 18 people are dead after ethnic Uighurs attacked police with knives and bombs at a traffic checkpoint in China’s western Xinjiang region, Radio Free Asia reported on Wednesday. via At least 18 dead in attack in China’s Xinjiang: Radio Free Asia | Reuters. Some local governments in China’s unruly far western region of Xinjiang are stepping up controls on the Islamic faith followed by the Uighur people ahead of Ramadan, including making officials swear they will not fast. via China steps up controls in unruly Xinjiang as Ramadan approaches | Reuters. via About 300 Chinese said fighting alongside Islamic State in Middle East | Reuters. Police have shot dead two suspects in the killing of the imam of China’s largest mosque and captured another, state media say. Jume Tahir was the imam in Kashgar, in China’s restive Xinjiang region. He was found dead after morning prayers at the Id Kah mosque on Wednesday. Police said the suspects, located shortly afterwards, “resisted arrest with knives and axes”. They were “influenced by religious extremism“, Xinhua news agency said. Xinjiang, in China’s far west, is home to the Muslim Uighur minority. Tensions have rumbled for years between Uighurs and Beijing over large-scale Han Chinese migration and tight Chinese control. In recent months, however, there has been a marked increase in Xinjiang-linked violence, including a market attack in the regional capital Urumqi that left more than 30 people dead. Beijing blames these attacks on extremists inspired by overseas terror groups. Uighur activists say heavy-handed restrictions on religious and cultural freedoms are fuelling local resentment. 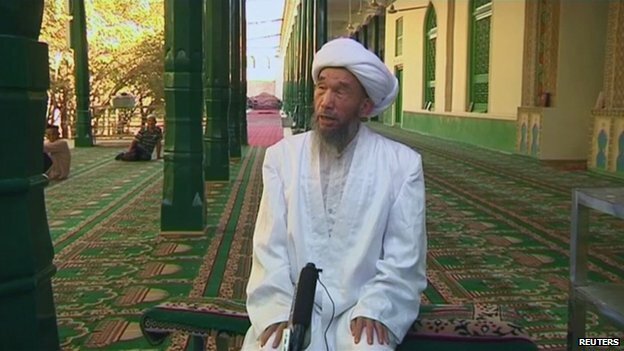 via BBC News – ‘Suspects shot’ in Xinjiang imam killing. China released on Thursday three activists who had been detained for a month for attending a meeting to commemorate the military suppression of pro-democracy protests in Tiananmen Square in 1989, their lawyers said. The activists were freed a day after the 25th anniversary of the bloody crackdown, marked by tens of thousands of people in Hong Kong, even as Chinese authorities sought to whitewash the event in the mainland. Two of their peers remained in custody. via China frees three activists after Tiananmen anniversary | Reuters.